I often find that the executor of a will is also an heir, but you cannot assign two Roles to the same person. Even if you could, the result would likely be odd narrative. So I have added a combined "Heir & Executor" role to accommodate this case. In addition, I find I often want to mention some heirs separately from others when describing their inheritances in the Memo of the Principal. So I created several "Heir" Roles so I can refer to them individually or in smaller groups. Further, I think some of the Sentences in the standard Roles can be improved upon. Enter the Testator (the one who wrote the will) as the Principal.. Enter the date signed in the date field. Enter a summary of the terms in the Memo, as you want it to print in the Principal's reports. See following section for detailed discussion of alternative methods. For each heir, executor, or person just mentioned in the will that you want to record in their own narratives, add that person as a Witness, and assign the appropriate Role. See section below for detailed discussion of alternative methods. The term <[M0]> in all the witness roles is "M-zero"  its purpose is to suppress the memo, in case you have the memo options turned on in the report definition. If you are not familiar with the use of Roles, the discussion in my Roles Tutorial article may help. Note that the will tag described in that article in not entirely the same as the one here. While I used a more elaborate sentence for the Principal in that article for purposes of explaining the use of role variables, I don't actually use that form in my own data as I find it needs to be unnecessarily complex to work successfully in a variety of real circumstances. For help with creating the sentence templates involved, see my article on Modifying Sentence Templates. The Will Tag as I have defined it requires the user to type into the Memo field any description of the contents of the will that is to be included in the output for the Principal. When that description includes the names of executors, heirs, etc., those names can be typed into the memo. That works fine, but has three disadvantages. It invites errors in typing, the names are not updated should you later change the way you entered the referenced persons' names, and the names do not appear as links if you output to Second Site. All those issues are solved by entering the names as Variables referring to the Witnesses entered in the Tag, rather than typing them in. But, in practice, I find that you often don't want to refer to all the heirs, say, as a group, but want to mention them separately. You can't do that when all the heirs are assigned a common Role, so I have created Roles of Heir1, Heir2, Heir3, etc. This allows individual heirs, or groups of heirs that will be discussed together, to each be assigned a separate Role. ...naming his brother Matthew and son-in-law Rubin B. O'Hara as executors. He named his eight children, leaving his daughters, Mary Ann, Margaret Aurelia, Helen Minerva and Larin Elvira, each a personal item, such as a horse and silver, and his sons, Mathew Skinner, Giles James, Chittenden Patton, and Thompson Archer, a sword, watch, or $100 toward their education. In this example, brother Matthew was assigned the Role "Executor" and son-in-law Rubin the Role of "Executor2" All the daughters are assigned the Role of "Heir" while the sons are assigned to "Heir2." Obviously, use of this method requires some thought about how the memo for the Principal will be crafted as the Roles are assigned to the other participants. Note that I've used different forms of the Role variables to produce first name only for the brother, full name for the son-in-law, and given names only for the children. Typing in the Variables is bothersome and error-prone. Instead of typing them, user the right-click menu in the Memo field to select the desired Variable from the "Role" section near the bottom of the menu. A general comment for that person, such as what an heir was to receive, which appears at the end of the output for that person. If used, this comment is entered in the Witness Memo. Their relationship, if any, to the testator. This is optional, and if used, is entered in the second segment of the Witness Memo. ...was named an heir in the will of Matthew Lyon, his father, dated 5 Jul 1822, to receive his gold watch. You can modify your existing Will Tag Type by copying the Roles and Sentences from this page, editing them as you prefer. Or, you can download and install a copy of my Tag Type using the Tag Type Import function. Replace your existing Will Tag Type – Doing so will remove any Roles not present in my Will Tag Type, such as "Testator." If you have actually assigned any of those Roles to people in your Data Set, you cannot use this method. Add as an additional Will Tag Type – Using the new Roles would then require you would have to choose this alternate Will Tag Type for new Will Tags, and change any existing Will Tags to this Tag Type. I recommend that you replace your existing Will Tag Type if you have not used the Testator or other Role not present in my Tag Type, unless you have already customized your Will Tag Type in such a way as to cause existing Will Tags to be disrupted. If either is the case, I recommend that you add my Will Tag Type as an additional Tag Type. In yet another misguided attempt by MicroSoft to be helpful, Internet Explorer insists on changing the file extension when you save the file, making it unusable. The best solution is to use a "real" browser, such as Opera or FireFox. But if you prefer to use Internet Explorer you can solve the problem by correcting the extension as you save the file. To do that, when the Save As dialog opens, change the "Save as type" drop-down at the bottom of the screen to "All Files." Then edit the File name just above, changing the ".zip" at the end to ".xtt" (for eXchange Tag Type). Replace your existing Will Tag Type – To do that, select the first option, "Import and overwrite if the tag type already exists." Click the OK button. If successful, you will get a confirmation message that the new Tag Types have been imported. If you have used any Roles not included in my custom Tag Type, you will receive a message that one or more Tag Types were not imported. You can then either create the new Roles manually, or use the alternate method below (recommended). Add as an additional Will Tag Type – To do that, select the second option, "Import and don't overwrite." The imported Tag Type will be called Will1 unless you check the "Add a Prefix" box below and enter a prefix, which will be applied to the Tag Type name. Click the OK button and you should get a confirmation message that the new Tag Types have been imported. 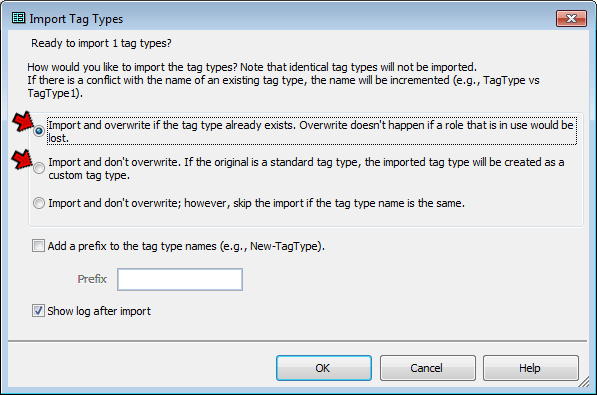 For further details on exporting and importing Tag Types, see my article Exporting and Importing Tag Types.